Proper Hunt: Case of the Mondays? Surprisingly, I don't have the Case of the Mondays. This is pretty rare considering I always get them - the Sunday Blues preceding them of course. But nope, no Sunday Blues were to be found yesterday and today felt like it was gonna be an OK day and so far it has been. I guess I should mention that I do have something to look forward too this week. NYC! A nice little weekend trip to New York City is something I have been looking forward too for awhile now (ever since we got back from Kenya). And we're staying with our good friend, Neil, who happened to go to Kenya with us this past August so it'll be great to catch up. But getting back to my excitement for this trip. I've gone to NYC lots of times but this particular time I am really excited because this time I get to go to these great shops that I've only read about and tell them about my blog! I am really hoping to make some new friends among the home decor community so wish me luck. 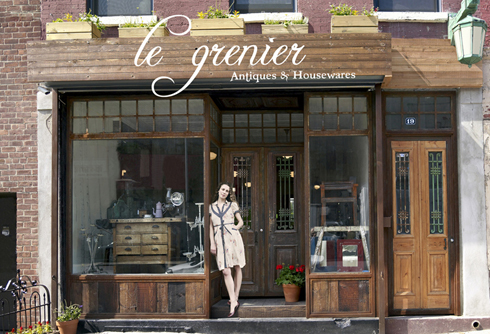 I've already made one friend with Maya Marzolf, owner of Le Grenier in Brooklyn which will definitely be one of my stops on this trip. And yes, you can bet all your Halloween candy that I will be taking lots of pictures of all of the cool stores that I stop at and posting them up when I get back. Pictures are probably the only thing I'll be able to bring back since I won't be able to afford anything at these stores! Speaking of pictures, here are some images from the stores that I hope to check out! I am REALLY excited about this! Flea Markets are one of those places where I could spend hours and hours perusing through all of the merchandise. And I'm going to take a wild guess and say that this particular one might be one of the best around. Yup, I am ready for it to be Friday now. I'll be counting down the days til I get there! Have fun! Can't wait to hear about your trip! Great choices-try to squeeze in Elizabeth Bauer (see my post today) and John Derian. Have fun! Thank you Style Redux! I definitely will. Love your blogs!